A government-controlled area in the embattled Syrian city of Aleppo has been hit by rebel mortar shells. At least seven children came under fire, five of them were killed. 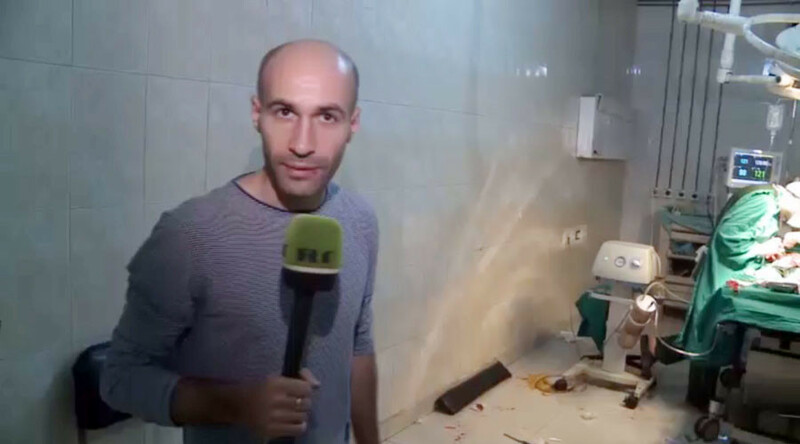 An RT crew has been reporting from the local hospital. A school and adjacent bus stop were hit by mortar shells in the government-controlled Al-Suleymaniya neighborhood of Aleppo, RT’s Murad Gazdiev reported from the Al Razi hospital, where the victims have been brought. WARNING: RT had to blur parts of the video due to its disturbing nature. A total of at least seven children and one adult were hit. Two girls, identified as Lama and Maria, died instantly, as they were closest to the spot the shell hit. “They were in the same class. They went to school together every day,” Murad wrote on Twitter. A five-year-old boy and his nine-year-old sister, were also among those killed – their bodies seen in the Al Razi hospital. RT spoke to one of the teachers who survived the attack. “They are from Hatim Al-Tai school. Brother and sister and two more sisters. I am the deputy head teacher at that school. Let them [the perpetrators] know that they are just pupils. They are my students. I carried them out with my own hands,” he told RT. “You [perpetrators] are bandits! It should all be brought to an end. One should completely eliminate them,” the deputy head teacher went on to say. Another 16-year-old child was killed in a separate attack on Seyf Aldawla neighborhood. Locals told RT crews that four shellings took place in Western Aleppo on Thursday, although this information has not been confirmed yet. Western Aleppo neighborhoods have often been targeted by rebel fire, with doctors at Al-Razi telling RT crew it has been overcrowded with the injured and on the brink of its capacity to provide emergency care and painkillers. Al-Razi is one of two hospitals in Western Aleppo equipped with emergency rooms. “Mortar victims are brought here. We might have 15 people brought to the emergency room in less than an hour,” Doctor Mouhammad told RT. “It’s hard psychologically on the doctors. The stress, the workload, the tension – they all take their toll,” he added. While filming at the hospital, the RT crew saw the appalling aftermath of indiscriminate fire in Western Aleppo. Ten-year-old boy Hassan, born deaf and mute, lost a foot in shelling two days ago, but survived. This 7-year-old was born deaf and mute. 4 days ago he lost a leg to rebel shelling in #Aleppo. “The day before yesterday he was playing with other boys in al-Hamadaneyah area when the shell landed there,” one of Hassan’s relatives explained. Another child, a five-year-old girl named Tasmeem, was hit by a piece of shrapnel from a shell that landed in Western Aleppo on Wednesday. She was brought to the hospital with her intestines hanging out. Doctors have been operating on her, saying she is stable for now. A boy, who also got injured in the latest attacks, told RT he witnessed how his brother die in the shelling. “A shell landed right next to me. I saw how my cousin was torn apart in front of my eyes,” the youngster, who was lying on a stretcher with a bandaged leg, said. “Why are you [terrorists] killing us, what have we done to you? Don’t you have a heart?” a woman inside the hospital said, expressing sorrow and frustration. The ordeal of civilians risking their lives under rebel shelling in government-held western Aleppo does not get much coverage in Western media. UK-based international affairs commentator Jonathan Steele believes it is done to paint Assad as the villain. “It’s part of ideological bias, […] there’s no doubt that the media seems to be supporting the anti-Assad forces. So they heighten anything being done by Assad in terms of casualties and then minimize what’s being done by enemies of Assad, the rebel groups,” Steele told RT.